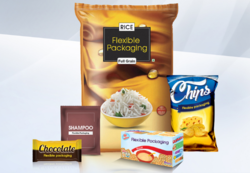 Garfilm MET PET -Corona is metallised film ready to use in flexible packaging application. Other side of the film is corona treated with good wettability. - Specially formulated emulsion for Polyester film lamination. - Rollers can be easily cleaned using warm water. We have gained recognition as an eminent enterprise, devotedly engaged in trading a broad range of Metalized Polyester Film. Metallized BOPET Films are used for Flexible, packaging, metallic yarn, sequins for textiles, decoratives etc. The thickness of films ranging 10 micron- 150micron, the max width is 2850mm, and min width is 210mm that can be slitted into different sizes as per customers' specifications. we have all microns polyester film or bopet film in any colour. - Usage: For textiles, decorative, packaging, metallic yarn, etc. Being a quality-centric organization of this industry, we are engaged in providing a wide array of Met Pet Film.